Ambassador Ahmet Üzümcü is a career diplomat with vast experience in multilateral diplomacy and disarmament and non-proliferation issues. Prior to his appointment as Director-General of the OPCW in December 2009, he was Turkey’s Permanent Representative to the UN Office in Geneva, where he chaired the Conference on Disarmament in March 2008. 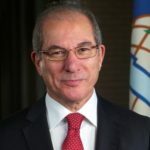 Ambassador Üzümcü completed his second term as Director-General of the OPCW in July 2018. Ambassador Üzümcü has also served as Deputy Undersecretary of State for Bilateral Political Affairs at the Ministry of Foreign Affairs, Turkey’s Permanent Representative to NATO and Ambassador to Israel, in addition to earlier postings to NATO, Aleppo and Vienna. He holds a Bachelors Degree in International Relations from Ankara University and speaks English and French fluently. He is married and has a daughter. Ambassador Üzümcü received the Nobel Peace Prize on behalf of the OPCW in December 2013. In December 2015, H.E. Mr Laurent Fabius, Minister of Foreign Affairs and International Development of France, decorated Director-General Üzümcü with the Légion d’honneur (rank of officer).